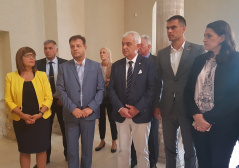 In the course of her official state visit to Bulgaria, the Speaker of the National Assembly of the Republic of Serbia Maja Gojkovic visited Veliko Tarnovo where she met with the Mayor, Daniel Panov. Gojkovic emphasized the importance of local and regional cooperation, stressing that it is the best way to actualize the excellent political cooperation. The Serbian Assembly Speaker said that tourism and cultural ties between towns and municipalities should be promoted and strengthened as these would bring the two countries even closer together and went on to discuss how to foster these ties with Mayor Panov. Panov said that Veliko Tarnovo enjoys excellent cooperation with Nis and is ready to develop cooperation with other local self-governments in Serbia. Panov accepted the proposal of the delegation of the National Assembly of the Republic of Serbia to develop closer ties between Veliko Tarnovo and Kraljevo in the coming period, to be rounded up by the signing of a cooperation and twinning agreement. Gojkovic said she was very happy to be visiting Veliko Tarnovo at the invitation of Mayor Panov due to its special status and cultural and historic significance, as well as its importance for Serbia and its people because of St. Sava, Serbia’s first Archbishop and Enlightener who spent his last days here, where he was buried, and which to this day remains a strong bridge of friendship between Serbs and Bulgarians. Gojkovic, accompanied by the Vice-President of the National Assembly of the Republic of Bulgaria Yavor Notev and the Mayor of Veliko Tarnovo Daniel Panov, laid a wreath on St. Sava’s tomb in the Holy Forty Martyrs Church. The National Assembly delegation also included foreign affairs and European integration committee members Maja Puzic and Zarko Micin.